Viewing topic "Renaming Multi’s in Xs Vst Editor"
I have just stored all of my old XS keyboard Performances as Multi’s in the XS. I now want to see them appear in the vst editors folders,but they only show the factory Multi’s,is there any kind of way I can see the ones I just created ,by rewriting over the factory ones? Thanks, I think this is all I’ll need to understand the process correctly for future reference. By the way the Rack XS is showing the Multi’s correctly,it’s just when I try to browse within the Vst editor the factory name multi’s are still there,and I do not see my Multi’s..
You do not have the VST Editor - It has not been released yet. Select CURRENT and set the direction to RECEIVE. Click “Start” this will request a bulk from the Motif-Rack XS for the Current (1) selected Multi, including the name. Again you do not have the Motif-Rack Editor VST and we are not sure what you mean by browsing the factory name Multis. If you are referring to “MULTI LIBRARY"… that is a reference library… A reference library is simply one that is Read Only (PRESET). 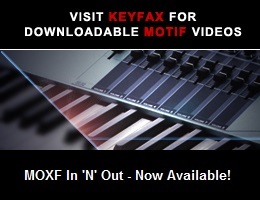 You cannot write to that library and it is provided so that Motif-Rack XS owner’s always have access to the 384 PERFORMANCES that are native in the Motif XS keyboard. Your Multis will never appear there. Hope that helps. I see.It would make sense if eventually with this next Vsti editor then,that Multi’s could be loaded and stored within the editor or mediabay in Cubase 4 or 5.Hopefully they consider this.. Thanks for clearing this up..
Each Cubase Project will use just one Multi - that is how it works… you can do that in the Studio Manager version of the Editor. Since a single Motif XS or Motif-Rack XS is sixteen Part multi-timbral only one Multi need to be stored with the Project. Because in a single Project you could use more than 16 XS Voices (via Program Changes) it is important that all USER VOICES, USER Kits and Preset Favorites be memorized and recalled with each Project so that the 16 VOICES you used, the 16 MIXING VOICES that you might have saved and all User Voices (that you might change to during the song) in the Motif XS/Rack XS at the time of the Project are also saved. Cubase also without any updating can store your Favorite Multi setups as TEMPLATES… we posted an article over a year and a half ago on how to set those up (Quick Setup Guides)… Each Cubase Template can include a specific setup (Multi) for your Motif-Rack XS. When you open a template it can store and restore any Multi to your connected hardware via the Studio Manager’s RECALL function. The tutorial article takes you through how to set these up. If that is useful for you - simply go for it. Don’t wait for the VST Editor - its strengths lie elsewhere. Cool yes I’m familiar with the tutorial,and I have wrapped my head around it,but the idea of actually storing my own personal Multi’s and re-writing over the factory content to view on the editor would be much more appreciated, and it would tie into the design better such as the voice’s do.. Currently viewing the names of my multi’s on the rack xs itself shows them just fine,but within the editor it’s only the factory presets.. No big deal though..a simple fix text fix would’ve been nice,for guys who work like I do. I use Multi’s as ways of layering a bunch of sounds to make just one large sound on one track vs.. splitting them up etc..
Till then I’ll be viewing the multi’s on the green screen of the rack just fine..And hoping on a release from Yamaha..